Eximius - from the beginning: My 1st Double Braid Line Splice. My 1st Double Braid Line Splice. During my Navy career, I leaned that you had to blow your own horn before someone else used it as a spittoon! 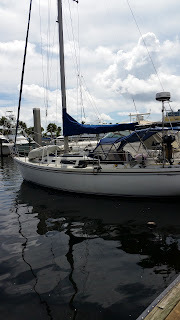 Over the past couple of weeks, I've been working on moving all of the mainsail reefing lines back to the cockpit so that I don't have to go up on deck to reef the sail. Like most monohull sailboats, Eximius demands that a person (normally me) goes up on deck to put in the mainsail reef to reduce sail area in anticipation of worsening weather. Going up on the deck is not the best place to be out on the ocean, but the way the lines were positioned on Eximius, it was a requirement. So we would normally put the 1st reef in place before we headed out and we would shake them out if the weather proved light enough to put all the sail out, for us, that's about 16kts, we like the boat upright. During this job, I took the extra step of replacing the almost new Main Halyard. I had replaced just a few months ago, and used the old line as the template for the new, but the old line was a good fit in the line clutches and I was reluctant to replace the line with something smaller, which is what the owners manual indicated should be used. RTFM! The Main Halyard line is $2.07 a foot and it's 119' long! expensive! So I replaced it with the line size from the manual. In addition to the line itself, there's also the cost of having a shackle spliced into the end of the line where it connects to the top of the Main Sail. That's a few bucks too! This time, I bought the tool for doing the splice myself, and here's the result - Did I hear a Horn blast! This is my first ever Double Braided Line Splice EVER! And it came out just too cool! 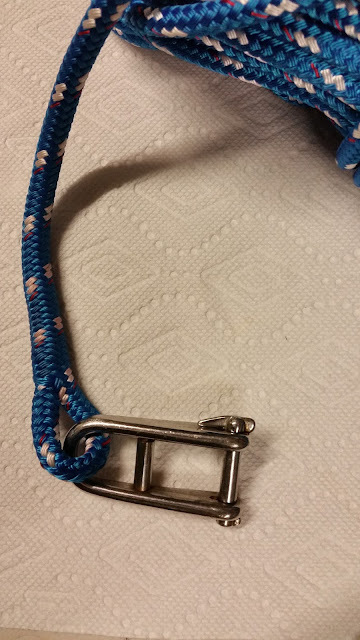 The line is 3/8 StaSet Double Braded Line, the shackle was from the original Halyard.